The National Federation Party has now included 23 basic items that will be VAT free, should they form the next Government. 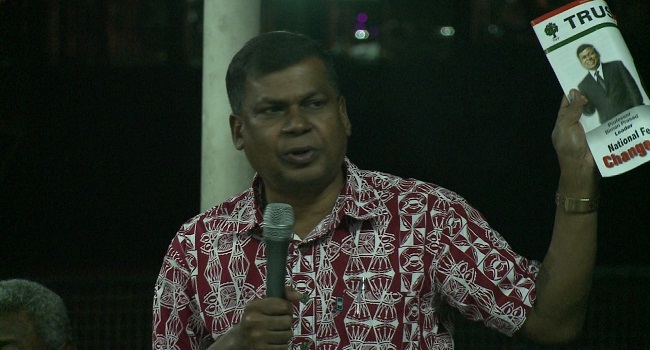 While launching their manifesto last night, Party Leader Professor Biman Prasad says this will include rice, flour, cooking oil, tinned fish, tea, powdered and liquid milk, butter, noodles, potatoes, onion, garlic, canned tuna, locally produced eggs, bread, locally produced frozen chicken, prescription medication, kerosene, women’s sanitary products, baby milk formula, diapers, toilet paper, soap and imported fruits. Prasad says they will also reduce duty on lamb products, ghee, school shoes and bags and reduce 20% excise duty on locally produced beer and spirits. He says that they will increase social welfare allowances for the poor, the sick and intellectually handicapped who are below the threshold of $30, 000. Prasad adds people between the ages of 60 – 65 will receive an allowance of $100 a month, 65 – 70 years will get $200 per month, and $300 will be given to those above the age of 70. He says the benefits of a growing economy should be available to all and not just the rich getting richer. Prasad mentions that if they form the next government, they will implement a minimum guaranteed price of $100 per tonne cane price effective from the current season. They will build a new sugar mill in Rakiraki, bring back an elected Sugar Cane Growers Council, improve the rail network and cut lorry waiting times at the mills and return leadership of South Pacific Fertilizers and the Growers Fund to growers. The Party Leader says all first-year courses fees for any degree program will be paid by government from next year. Prasad adds all students’ debt under TELS that have a combined family income of less than $30, 000, will have their loans converted to a grant. The Party will also remove daylight savings.